River Lodge consists of just 14 luxury double rooms and a further four suites. 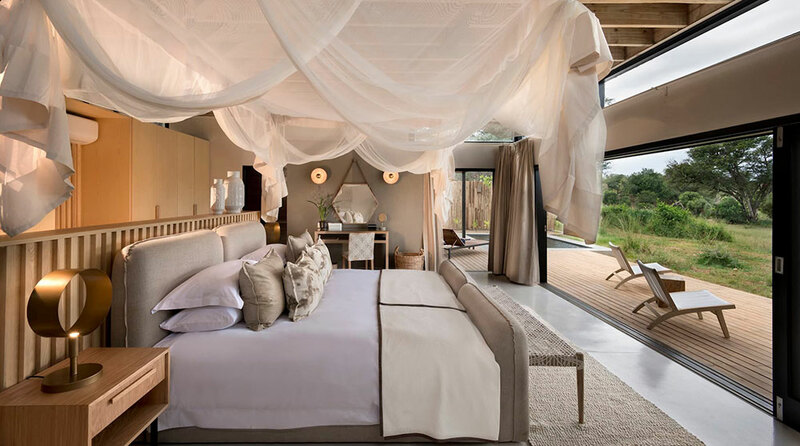 Although purpose-built modern structures with sleek lines and contemporary decor, each seeks to recall the traditional safari experience, making use of natural materials and optimizing natural light wherever possible. From the wood of the exterior sun deck that surrounds the communal pool to the wickerwork chairs of the spacious shared spaces and the rattan of the high-pitched roofs, River Lodge manages to blend effortlessly into the area’s landscape of tree-studded bush. 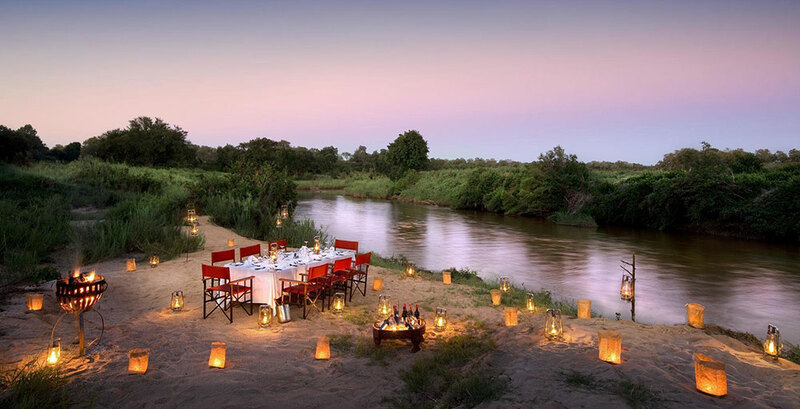 Situated on the banks of the Sabie River, the lodge is located within Sabi Sand Reserve. 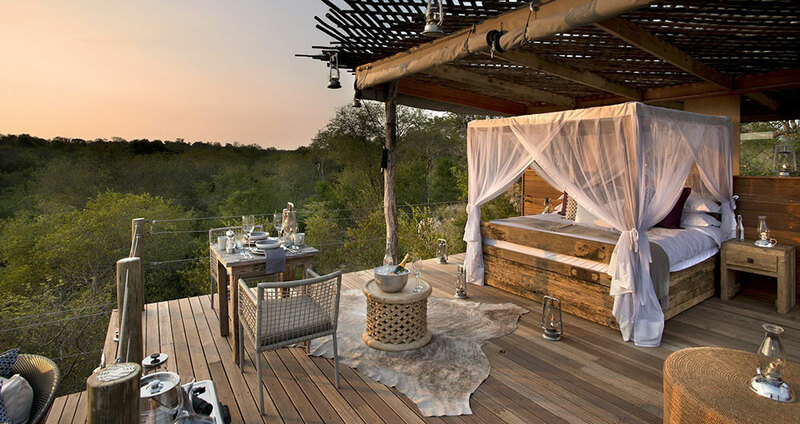 The oldest of South Africa’s private game reserves, it lies adjacent to the world-renowned wildlife spectacle of Kruger National Park, with animals moving between the two untroubled by border fences. 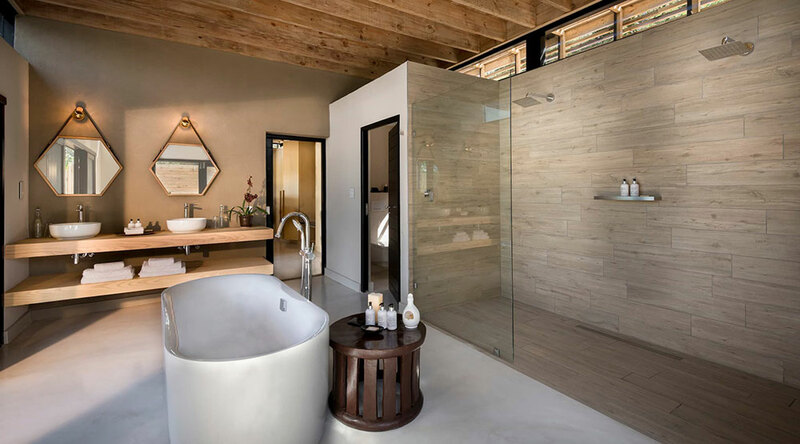 Their subtle styling and natural palette of colors extend throughout the bedroom, en-suite bathroom, private lounge area with mini bar, and outdoor deck. The four additional suites (one comprising two bedrooms) each boast a private plunge pool with outdoor shower. Facing on to the Sabie River, the 14 rooms of River Lodge are divided into eight luxury rooms and six larger-sized superior luxury rooms. The shared living spaces include the Safari Lounge and bar, barista station providing artisanal coffees, a spa, and a small gallery showcasing the work of local artists. 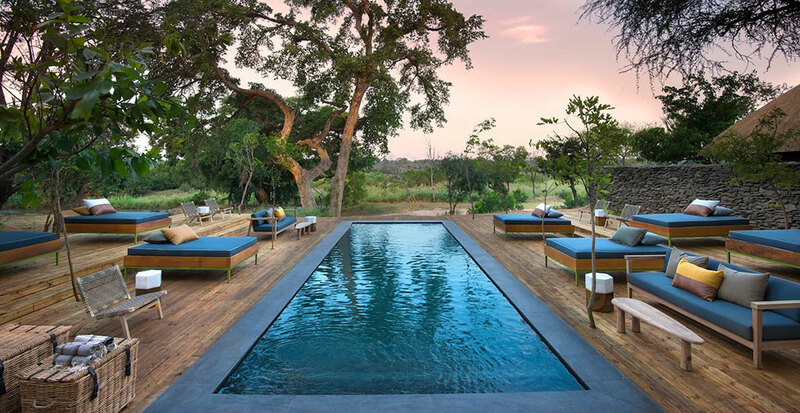 The communal pool is surrounded by a large sun deck, while freshly-prepared meals can be enjoyed on the dining deck, by the river, or in the traditional boma for a more authentic experience. 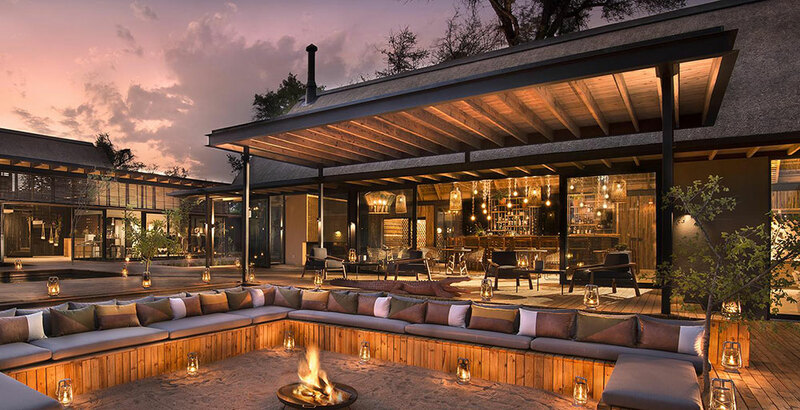 A fire-pit provides a second outdoor focal point in which to share stories of the day’s safaris. 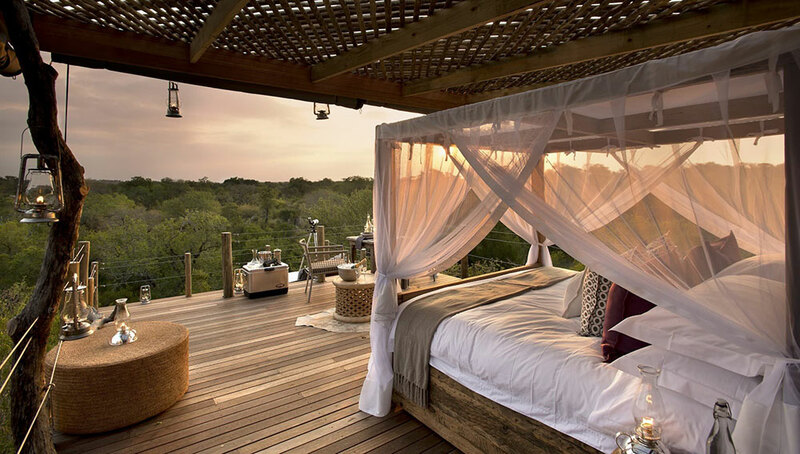 Sabi Sand Reserve spans more than 150,000 acres of privately-owned game reserve. Sharing a 50 km unfenced border with Kruger National Park, it has one of the highest and most diverse populations of wildlife anywhere on the continent. Known for the quality and proximity of its leopard sightings, guests also have the chance to see the other four species that together make up the Big Five (elephant, rhino, lion, and buffalo) in addition to the 140 further mammal, 110 reptile, and 500 bird species that have been recorded in the reserve. As a privately-owned reserve there are no time or route restrictions for safaris. 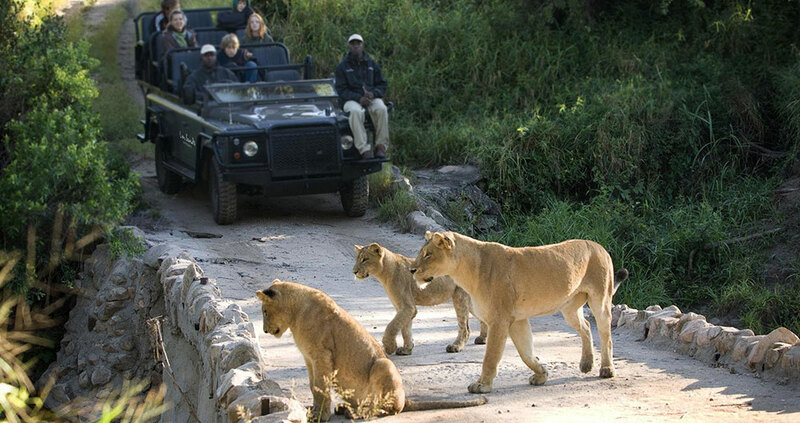 The open-top vehicles used are able to travel off-road into the dense bush to catch animals in their natural habitats, while guests can also undertake walking safaris with the lodge’s expert guides and trackers. Away from wildlife spotting opportunities, River Lodge also has the on-site Africology spa which offers a range of rejuvenating body treatments. Want to see Lion Sands River Lodge as part of a trip? Enquire today to let us help build your holiday.